As a young art student in the late 90â€™s, I attended a talk given by Ernesto Pujol at RISD, where he presented his then-current project: an installation of Nazi-era porcelain as a commentary on whiteness, purity, and the attendant relationship these meanings have to the atrocities of World War II. I was immediately struck and moved by his handling of materials and ideas; it was one of those projects that burned itself into my consciousness and stayed with me for a long time. Fast forward to 2012, and once again I came into contact with Pujol through writing for A Blade of Grass Foundation, where we both had been contributing our thoughts and research. I reached out to let him know of my long-time admiration, and he reciprocated with an invitation to his home for afternoon tea. When we met, his charisma and generosity were just as disarming as that morning lecture at RISD so many years before. Pujol is a site-specific public performance artist and social choreographer. 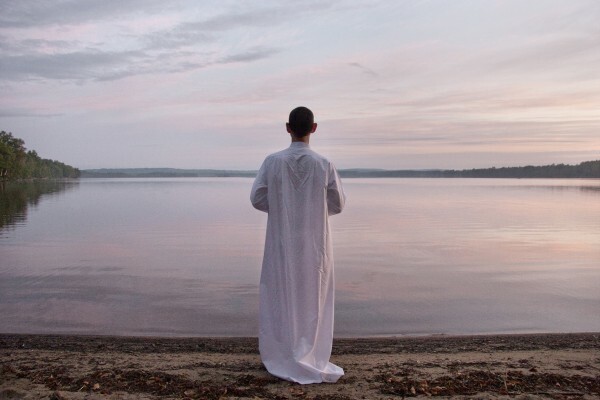 He has a long record of intellectual and interdisciplinary art practices which have dealt with concepts of collective and individual and collective identity, the sacred, social and political issues, and public/private space. Since the late 90’s, Pujol has also been working on public group performances, where the focus has rested with action, movement, the journey â€“ and the central concept of the â€œartist-as-citizen.â€ Additionally, he is the founder of The Field School Project, where Â young and emerging artists are individually mentored in site-specific practices. This fall, in conjunction with the French Institute Alliance FranÃ§aise, Pujol is bringing his first public group performanceÂ to New York City. Time After UsÂ isÂ an ambitious, 24-hour collaborative perambulation of the interior of St. Paulâ€™s Chapel in downtown Manhattan. By walking the space, animating it continuously from the morning of October 3rd through the morning of October 4th, Pujol and his twenty-three cohorts will produce a work about rest, second chances, and healing the past. You’re currently getting ready for a major performance, Time After Us, at St. Paulâ€™s Chapel in downtown Manhattan, where you and a group of 23 collaborators will walk for 24 hours straight. Can you tell me a bit about how this project came together? The curators of Crossing the Line 2013 contacted me last year, asking me to meet with them at the French Institute Alliance FranÃ§aise. They invited me to develop a new performance for the festival. This happened shortly after hurricane Sandy. They were moved by how New Yorkers united and responded to the catastrophe. They were also concerned about the future of the city, in terms of climate change. For the past two years, I had been quietly envisioning a performance that was constructed like a vortex, with performers walking a circle backwards and counterclockwise; combining vulnerability with the notion of the natural passage of time, time past and time to come, coexisting simultaneously in the now. I proposed it to them and they embraced my concept. St. Paulâ€™s is an historic episcopal church, but became an important contemporary touchstone when it provided a center for relief and recovery workers during the period surrounding 9/11. Does its connection to the nearby Ground Zero site have a relationship to Time After Us? I first developed the concept for the performance without a site. Initially, I wanted a vast interior, enough to hold a mighty river of people whirling, and hundreds of people surrounding them, watching silently. We considered the Armory and Saint John the divine, among other spaces. Curator Gideon Lester suggested Saint Paulâ€™s Chapel in Wall Street. Curator Simon Dove and I visited the site and fell in love with its interior and exterior. The third curator, Lili Chopra, approved it. The chapel feels like a little island within the larger island of Manhattan. It contains an amazing statement about mortality, with its green graveyard. There is no intended connection to 9/11, to Ground Zero. It is not a performance about loss and mourning, although a viewer may contribute that reading out of their own life story. For me, it is primarily a performance about rest and second chances; about revisiting the collective and individual past, and trying to heal it. I have had many solo exhibitions of images, objects and installations in galleries and museums in New York since the early 1990s. But this will be my first public performance, in terms of how I constructed my group performance practice since the late 1990s. Thus, this is not a â€œmove,â€ in the career sense. It was an unexpected invitation, which I accepted with humility, as a matter of public service. I believe in Carol Beckerâ€™s notion of the artist as a citizen, a cultural worker. I simply seek to offer the city a place of psychic rest. I have lived and worked in this city for 28 years. I am 56 years-old. I have served as an educator in most of its art schools, as lecturer or adjunct instructor. There is no right time or wrong time. As a Zen Buddhist, I do not believe in human time. I am offering an ephemeral space-within-a-space for manifesting the intangible. You’ve enacted many collaborative projects with diverse groups of people who are not necessarily artists. Â How do you prepare someone â€“ physically, intellectually, psychologically â€“ who is not an active performance artist for an engagement like Time After Us? As Rebecca Solnit said in her history of walking, one of my favorite texts, walking is one of the traits that made us human. Everyone walks. I believe that everyone yearns for moments of restful silence and creative solitude. They are a human right. I cannot imagine discerning oneâ€™s individual or collective future, in terms of deep decision-making, without them. And slowness. One needs to protect moments of slowness. I believe that these basic yearnings are found within and shared by all human beings. My performance trainings simply name them, identify them, and encourage them out of bodies. I work like a midwife, unleashing remarkable human potential. That was the second of two performances Jeffrey Baykal-Rollins asked me to collaborate on. We initially met in New York, where he did an internship with me one summer, at the end of which I strongly encouraged him to found a performance group in Istanbul. Turkey is undergoing great political changes. Its hybrid democratic tradition is under threat. The Turkish people are seeking many interventions and I was happy to support the use of metaphor in this cause. 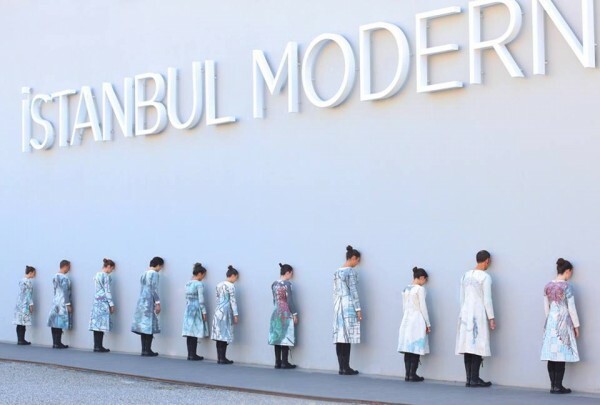 The silent group performance took place in the courtyard of Istanbul Modern. Many people came, professionals and students, young and old. They read through our encoded language and understood quite clearly that we were mourning the recent and ongoing violence, seeking to uphold the best of the Ottoman past, while also cathartically releasing anger and frustration, and finally finding a moment of rest before disappearing into their uncertain future. I experienced a humbling gratitude for being allowed to contribute my voice to the nation.